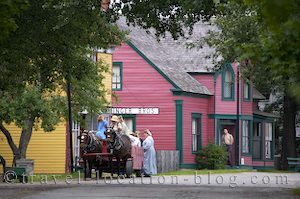 Colourful costumed and informative guides in Sherbrooke Village Nova Scotia. The next morning, after taking care of the usual housekeeping involved with being on the road constantly, we visited the Village of Sherbrooke. Sherbrooke Village is a living-history museum of restored buildings. In the late 1800's Sherbrooke boomed with shipbuilding, lumbering and gold mining activity. Each building, whether it be the pharmacy, general store, doctors office etc, is staffed by knowledgeable costumed guides. Special demonstrations featured throughout the village include pottery, weaving, candlemaking, printing, and wood turning. With the weather turning bad once again, we made a beeline for Halifax where we'd end up being for nearly two weeks!